Black Cohosh Side Effects: What Is Black Cohosh? 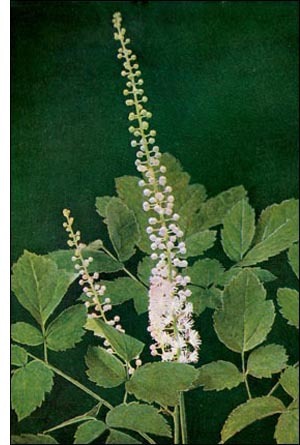 Black cohosh side effects are not severe. What is black cohosh? It is a perennial herb and a shade loving plant. It is found in the woodlands of the Atlantic seaboard and in eastern Canada. Many of the earliest patent medications contained high concentrations of this medicinal herb. Remifemin is one of the world wide best selling forms for treatment of menstrual problems. Available in tinctures, tablets, extracts and capsules, black cohosh balances hormone levels in both men and women. The most important use is in maintaining the therapeutic response to estrogen replacement therapy (ERT) as ERT is withdrawn. It is also useful in treating PMS symptoms.The active compound is believed to be 26-deoxyactein. Below are listed some of the black cohash side effects and which medications you cannot mix with this herb. Black cohash and menopause. Offsets a decline in estrogen by supplying phytoestrogen which binds to estrogen receptors in the body. Lessens hot flashes, vaginal dryness, headaches and mood disturbances. Does not stimulate breast tumor growth. May be useful in menstrual migraine. Fibroids. Increases blood flow to uterus, reducing uterine cramps and fibroid pain. Infertility. Increases motility and viability of sperm against environmental toxins. In 2001 the American College of Obstetricians and Gynecologists stated that Black cohosh may help with menopause hot flashes when used short term, which means less than 6 months. Think of it as an estrogenic type of herb. 10% of women may experience stomach upset for 1-2 weeks after starting treatment, therefore is best taken with meals. Allow up to 8 weeks to see any benefit, with up to six months to get the full benefit. Another one of the black cohash side effects is that it is less likely to be effective if taken with oral antibiotics which kill gut flora needed to acidify the environment for best absorption of black cohosh. It should not be taken in the following conditions: pregnancy, nursing, girls in puberty, estrogen sensitive cancers. May interfer with birth control pills and is sedating so do not mix with other sedatives. WARNING: Do not take Black Cohash if you are taking the anti-seizure drug Depakote (valproic acid). Black cohash causes an interaction that lowers your Depakote levels and in turn can cause seizures. If you take Depakote for migraines, then you may have more headaches. You should not take this herb if you are currently getting chemotherapy that contains cisplatin. You can read about herbs and chemotherapy. DO NOT confuse with blue cohash which is toxic. There is a reported case of a baby who developed neurological complications after a birth that was induced with a combination of blue and white cohash (which is also toxic). Avoid Black cohash if you have an allergy to anything in the buttercup plant family. This herb also contains some salicylic acid which is aspirin. If you take aspirin daily do not mix it with this herb. Do not take it if you have a history of liver disease, stroke, hypertension or are at high risk for a stroke. Gunn TR, Wright IM. The use of black and blue cohosh in labour. N Z Med J. 109.1032 (1996): 410-411. Newton KM, Reed SD, LaCroix AZ, Grothaus LC, Ehrlich K, Guiltinan J. Treatment of vasomotor symptoms of menopause with black cohosh, multibotanicals, soy, hormone therapy, or placebo: a randomized trial. Ann Intern Med. 145.12 (2006): 869-879.